Congrats! You've made it to the third trimester of pregnancy! It may be hard to believe, but in three short months or less, you will be giving birth to your baby. You have already made it through so much in your pregnancy (morning sickness, pregnancy ailments, stretch marks, etc. ), but there are still a few more things to endure as you enter this final stage of pregnancy. Some may be welcome changes, while others are pregnancy ailments that reappear as your body prepares to give birth. You're almost there! Learn about what you can expect in the third trimester of pregnancy and how to know when you are in labor. The third trimester of pregnancy generally starts around 27-28 weeks. Basically, it is the last three months of your pregnancy, give or take a few days or weeks. If you are in the beginning of this trimester, you can expect to go into labor and give birth in roughly 10-12 weeks. This varies depending on a number of factors, such as previous pregnancies, previous pre-term births, health of the mother, health of the baby, etc. What is the one thing you are dreading the most in the third trimester? Transitioning from the second trimester to the third trimester can be rough, especially when some of the old first trimester symptoms begin to reappear and stay until you give birth to your baby. While they seem depressing, most of those symptoms and ailments are just signs that you'll have your little bundle of joy in your arms very soon! On the upside, there's one fun thing to look forward to in the third trimester, especially if this is your first baby: a baby shower! Most women have their baby shower about a month before the baby is due to arrive. Read about some of these things below, and learn how you can manage the ailments and prepare for the birth of your baby! Many pregnant women suffer from a variety of skin conditions during pregnancy, such as stretch marks, acne, and rashes. Learn about the possible skin conditions and safe remedies for them during pregnancy. If you were to look into your womb during the third trimester, you'd see a fully formed little baby. Your baby, although still thin, looks like the infant that will be in your arms in 10-12 weeks. The remaining weeks of development are for fat stores to develop, brain development, and for lung maturity. If your baby were to be born at the beginning of the third trimester, he or she would have a pretty good chance of survival, although there would be medical and health challenges to face with a probable stay in the NICU. Around weeks 27-33, your baby may weigh around 2-4 lbs and measure 14-17 inches in length from head to toe. When you reach the middle of the trimester, chances of survival without medical intervention or health issues is even greater. Around weeks 34-37, your baby may weigh around 4-6.5 lbs and measure 17-19 inches in length from head to toe. After 37 weeks, your baby may be considered full-term, meaning fully developed and ready to be born without any major complications other than slight breathing difficulty in the beginning. Many babies born during this week are fully healthy and do not need to spend time in the NICU. That doesn't mean that your baby should be born then or that you should try to induce labor yourself around then; your baby may still need the extra few weeks left to grow and allow the lungs to mature. From 38-40 weeks, your baby may weigh around 6.5-7.5 lbs and measure 19-20 inches in length from head to toe. If your baby decides to stay in the womb a bit longer, he or she may come out weighing over 8lbs or more. At this point in pregnancy, you may have already gained roughly 10-20 lbs. Those who experienced extreme morning sickness in the first trimester may have gained less, and those who took the 'eat for two people' idea literally may have gained more. On average though, pregnancy weight gain at this point should be around 10-20 lbs. In the third trimester, you can expect to gain another 1-2 lbs per week. Most of this weight should be from the baby, who will go from around 1-2 lbs to 6-8 lbs by the time he or she is born. The rest is from increased maternal blood stores, increased breast tissue, and fluid retention which is common in the third trimester. Try to maintain a healthy weight in the last few weeks. To do this, you should still continue to eat a balanced diet and try to get in as much exercise as possible. The best exercise at this point would be walking, as it is easy to do and can help you as you approach labor. Worried about gaining weight during pregnancy? Learn about healthy weight gain during pregnancy and what is right for you and your baby. Most women experience an overwhelming sense of fatigue in the first trimester, but then find out that it fades away during the second trimester. Guess what? It returns in the third trimester! Most often, third trimester fatigue is due to the fact that the pregnant woman is carrying the extra weight of the baby (now about 2-3 lbs), amniotic fluid, maternal blood stores, and her own weight all day long. That can all really take a toll on someone's body, causing intense fatigue! Another reason for third trimester fatigue is the lack of sleep a pregnant woman gets at night. Once resting in bed with a big, round belly becomes uncomfortable, plus the added bonuses of leg cramps, backache, and frequent urination, sleeping is nearly impossible. Without enough sleep during the night, a pregnant woman can become increasingly fatigued during the day. It becomes a vicious cycle, one that some say prepares the woman for the sleepless nights with a newborn. At this stage, getting enough rest whenever possible, staying hydrated, and getting in a little exercise can help with the fatigue. For more tips and helpful suggestions, visit How to Fight Pregnancy Fatigue. Pregnancy fatigue is often one of the first symptoms of pregnancy. Learn how to fight fatigue during pregnancy and keep your pregnant body feeling refreshed during both the first and third trimesters. Remember when early pregnancy had you heading to the loo every five minutes? Those days are back again! Now it's not just hormones or your growing uterus sitting on your bladder--it's your 2-3 lb baby sitting on your bladder and using it as a punching bag! As your baby grows and gains weight in the third trimester, he or she begins to run out of room in your abdomen and sits once more on your bladder, giving it very little room with which to fill up and hold urine. One minute you'll be fine, and the next second as the baby moves, you'll find yourself running to find a bathroom to empty the two or three drops that cannot longer be held in your bladder. At this point in pregnancy, you may be very tempted to withhold any fluids so that you're constantly not running to the bathroom, but it's imperative that you continue to drink at least eight 8 oz. glasses or more of water or other suitable fluids to stay hydrated. Try to drink it during the day so that you're not running to the bathroom in the middle of the night. Between 24-28 weeks, your doctor may ask you to have a gestational diabetes blood test, whether or not you have any risk factors for it. It's usually a one hour test for which you are asked to drink a 50 mL glucose drink and then have your blood tested after an hour. If any of your levels are high, you may be told to get the three hour test for which you need to drink a 100 mL glucose drink and have your blood drawn three times over three hours. If you have gestational diabetes, it can be potentially harmful to you and the baby, but only if uncontrolled. With diet and blood glucose monitoring, it can be kept under control and there can be no other complications for you and the baby. Learn more about gestational diabetes and its symptoms and treatments here: What is Gestational Diabetes During Pregnancy? During the third trimester, your body begins warming up for labor and delivery. One of the ways it does this is by having practice contractions, called Braxton Hicks contractions. These contractions generally start around 25-28 weeks, although for those who had previous pregnancies, they can be felt sooner. Braxton Hicks contractions are not real labor contractions. In fact, many women mistake them for the real thing, which is why they are often called 'false labor pains'. Braxton Hicks are different from regular contractions since they are usually painless and do not become consistent or more intense. Real labor contractions are consistently a few minutes apart and become more and more painful and intense. To learn more about contractions and what they feel like, visit: What Do Real Contractions Feel Like? Beginning sometime after the 25th-28th week, your doctor may ask you to begin kick counts. Kick counts are counting how long it takes your baby to move at least 10 times every day. Why do you need to do such a thing? After 25-28 weeks, you will be definitely noticing your baby's movements from the outside, and you may even get to know the sleep and awake patterns your baby has. A decrease in your baby's activity could be a sign that the baby is in distress, for which you may need a non-stress test to see what is going on. It's pretty simple. You choose a time of the day when you know your baby is most likely to move (usually after a mealtime, although some doctors like you to start first thing in the morning). Get into a comfortable position, sitting or lying down, and relax. 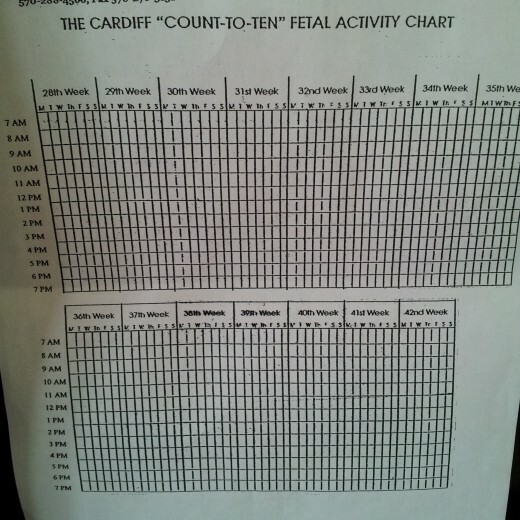 Make note of when the baby moves, either on a chart or in a notebook. Once you reach 10 movements, your charting is complete. It should only take about an hour or two for this to happen. It could take longer, but if your baby does not make 10 movements within a 12-hour period, something may be wrong and you need to call your doctor. Do you work and don't have a chance to be stationary when doing your kick counts? You can keep track while on the go, but it may be harder to do since your baby may be lulled to sleep by your movements. Find some time each day when you can be still, such as first thing in the morning or during a lunch break. On average, labor begins after the 37th week of pregnancy, but it can be as late as the 41st week of pregnancy. If labor occurs prior to the 37th week, it is considered pre-term labor as the baby is not full-term yet. If you feel these symptoms plus contractions, you should begin to monitor your contractions. If they are consistently 5-6 minutes apart, increase in intensity, and do not stop due to hydration or change in position, you may be in the early stages of actual labor. Something to think about is what should happen if your labor fails to progress or medical intervention is needed. While you may be hoping for a natural delivery, you may be faced with the potential of a c-section. 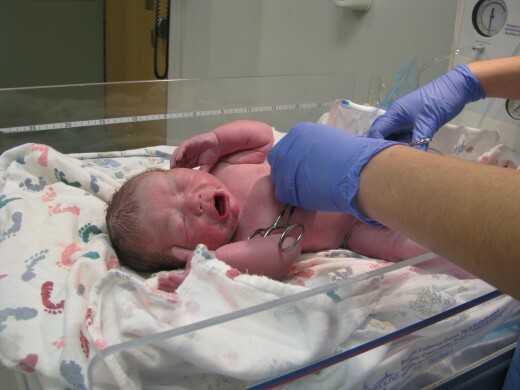 Learn about c-sections and how you can prepare for one here. If at any time you feel cramping in your lower abdomen or pelvic region that does not subside prior to the 37th week, contact your doctor. It could be a sign of pre-term labor. Otherwise, cramping after 37 weeks may feel like menstrual cramps and may accompany contractions. It's a sign that your cervix is effacing and dilating, getting ready to let the baby come down into the birth canal. Occasional spotting during pregnancy tends to be harmless, but it is still something that should be reported to your doctor, especially in the third trimester. It could be a sign of impending labor or it could indicate a problem with the placenta, such as placenta previa when the placenta covers the opening to the cervix. The end of pregnancy means you get the best gift after all of your hard work: a newborn baby. Are you ready? Baby supplies and gear. Do you have everything you need for a newborn baby? If not, have you prepared yourself financially for the baby expenses you will encounter? Baby Shower. Most women have their baby showers a month before the baby is expected to arrive. Where will you register? What baby items will you add to the list? Baby Nursery. Have you prepared the baby's nursery or have a space in your bedroom for a crib or bassinet? What will be the style of the baby's room? Hospital Bag. Being that labor will happen soon, do you have your hospital bag ready? Do you have a going home outfit and a car seat for the baby? Breastfeeding or Bottle Feeding. How you feed your baby is your choice, but try to learn as much as possible about both breastfeeding and bottle feeding so you are prepared. Maternity Leave. If you are working, will you be taking maternity leave? Have you started the process for FMLA? Will you return to work or become a stay-at-home mom? The third trimester may go by fast for you, so you'll want to think about these things soon. In no time at all, you'll have a baby to care for! What You Should Put in a Hospital Bag When Having a Baby: Helpful list of items for mom, baby, and dad to include in your hospital bag when having a baby, plus free printable. You've made it to the end: congratulations! From here on out you can be excited for the arrival of your newborn baby and your new role as a parent. Best wishes with the rest of pregnancy and the birth of your baby! For more pregnancy and baby articles, visit my profile here. Dandi, hang in there!! Best wishes! I am 41 weeks pregnant and very weary! I hope this baby comes very soon! Great post and very useful and "familiar" as I am in my third trimester, of my first pregnancy. One thing you left out that plagues me constantly, shortness of breath! It is amazing how often I forget that I lose my breath the quickest just by laying on my back. Nightly I go through the un-comfortableness before remembering to flip over onto my side (which seems to take another whole two minutes to comfortably do) :) Word to any other first timers: protect the lungs! DzyMsLizzy, that's an excellent point: not every labor and delivery goes according to the book! I could only imagine being told by my doctor to wait it out...Since women are the most in tune with their pregnant bodies, they do know when things aren't right! Babies do tend to be bigger these days, but it could be from a variety of factors. I have read that there are many more big babies today due to rising cases of gestational diabetes, but it could just be due to genetics as well. Thanks so much for reading and sharing your story! ComfortB , thank you very much! MKayo, it is detailed, isn't it? Being that I'm currently going through the 3rd trimester, I guess I had a lot to share about it! :) Thanks so much for reading! torrilynn, good luck to your friend, and thanks for reading! J.S.Matthew, you never know these days... ;) Thanks so much for your kind words and for voting up and sharing! Congratulations on HOTD!! Very thorough and well- formatted information. Super useful for first-time moms! I do notice, babies seem to be bigger these days. Both of mine were in the "formerly normal" 7-pound range; all of my grandkids were over 8 pounds, with the boys entering the world at nearly 10 pounds! Just a word to the wise--labor does not always go according to the book. With my first, the pains did NOT follow the decreasing time intervals AT ALL. At first, I thought I had simply eaten too much, as it was right after Thanksgiving dinner. But, no, it turned out to be labor..but, the pain intervals, from the first up until delivery was imminent, ranged from 5 minutes; 20; 10; 7; 5; 3; 15; 2, etc. no decreasing time pattern ever established. When I called my gyn, he said, "wait for a more definite sign." I did. My water broke at home. I barely made it to the hospital in time to get into the delivery room, and my baby was delivered by hospital staff doctors, because MY doc was taking his time, thinking, "Her first kid, I've got a couple of hours, at least." Congratulations on your article being selected Hub of the Day Practical Mommy. I can see why. This is an excellent, well researched article. Great job! This hub must of took a lot of time. It is so well organized and packed with useful information. I used to be a childbirth educator and doula and if I teach again, I would definitely recommend your hub as a resource. Wow! So much detailed info! Love the way this info flows and the professional looking layout of the Hub. Voted up. Great job and congrats on winning HOTD! great hub for expecting women or women that would like children in the future. my friend just found out that she is pregnant and im sure this hub will be beneficial to her when she is in the later stage of her pregnancy. very informational on what will happen, being in labor, and the tiredness you will experience.thanks. voted up. Although I doubt I will get pregnant any time soon, I did find this to be very informative and your layout is awesome! Voted up and shared. Congrats on the well deserved Hub of the Day! We are patiently waiting for my granddaughter to enter the real world. OK, not so patiently...more over-excited. Any day now...Yay! Good luck with your #3.
iamvijay, thanks for reading and commenting! awesome hub and congrats too that your hub has been selected as the hub of the day. TravelinJack, that was a big baby! I'm sure she did great, though. Many petite women have large babies and live to tell the tale! Thanks for stopping by! Haha that reminds me of my sister when she was pregnant. She's five nothing and had over a 10 pound baby! You've done such a wonderful job explaining every aspect of this last phase for mom and for baby (and everyone). It's such invaluable information and so well described and will help thousands and thousands of pregnant mothers (and their family). Well done on such an incredible piece of work and your well earned HOTD. 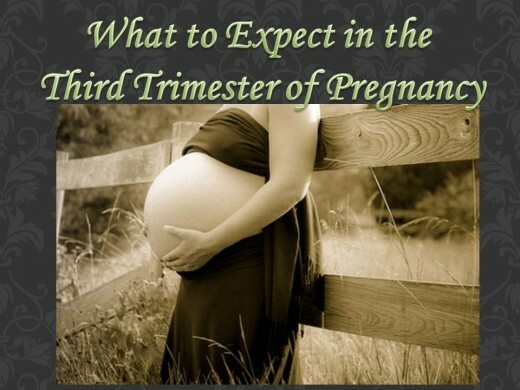 What a fantastic guide to the third trimester! I remember being heavily pregnant in the summer, and the heat and humidity were extremely draining. The fatigue was the hardest thing for me to deal with, particularly since my older son was just a toddler and was extremely active! LaThing, I'm glad you enjoyed all of your pregnancies! Not everyone can say that. Thanks for reading and commenting! I love putting your newest articles on facebook! Very helpful to those young ladies out there I know going through this very time frame! What great serendipity! And a wonderful hub. Thanks a million. I voted this way up because it has lots of wonderful information and is so well designed and written. This is certainly helpful for the mom-to-be. Interesting and will be so useful to many readers I am sure. Havea great day and I vote up and share.